Five of us in OVERDRIVE own motorcycles. Four are KTMs, all displacing 373.2cc - two with fairings and two with their internals proudly exposed to the elements. Nicely puts the affordable Indian sport biking scenario into perspective, doesn't it? 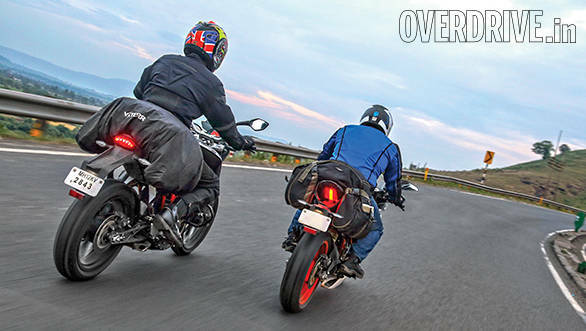 As you're probably aware, we're big fans of the KTMs available in India with both Shumi and I loving our 390 Dukes to bits. Halley and Rohit however were holding off for the admittedly sexier RC versions and are very besotted with their brand new rides. At this point, the big question is whether the Duke owners have started coveting their neighbours' bikes or whether the RC boys are finding their gorgeous sport bikes a little too hard for daily use. Or is there really no difference at all, aside from the looks? We could sit around forever discussing it, or we could get on the road and find out. It was the long Diwali weekend - a perfect excuse to make a 1200km round trip to Goa. At precisely 5am, Halley and I met up outside Mumbai. Both bikes were brimmed, Viaterra Claw bags securely fastened over the rear seats and we were raring to go. There was hardly a soul on the highway as we set off down the wonderfully quick and winding old Pune-Mumbai highway. Since Halley's bike was just a couple of days old, we decided to stick to our own machines for the first few hours. 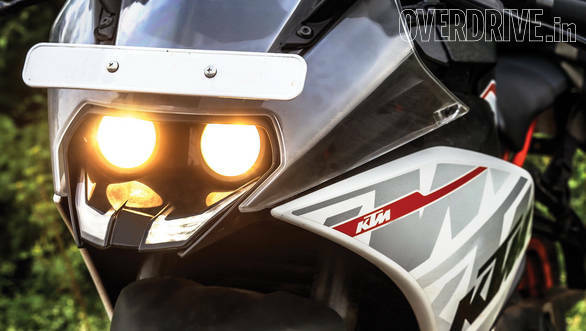 The Duke has a great headlamp but the RC's projector lamps are even better so it led the way. There was a sharp nip in the air and I found myself tightly hugging the Duke's frame trying to absorb some warmth off the engine. But the irony - the same heat that can make things rather uncomfortable in heavy traffic was nowhere to be found - the engine running sweet with just over half the temperature gauge filled. The 390s were in their element running fast and free. A brisk one hour and twenty minutes later we were on the Pune bypass with me leading when I discovered something interesting. There's a rough and broken diversion to one of the long flyovers that's been under construction for a while. I instinctively stood up on the footpegs and rode through without much thought. On the other side, I looked into my mirrors and found Halley had completely fallen back and was gingerly inching the RC through the roughness. When he finally caught up, he exclaimed that he simply couldn't carry the same pace, partly because it was his brand new pride and joy but mainly because the crouched down position doesn't feel very comfortable off road, but naturally. The front biased feel of the RC just doesn't feel as natural as the Duke's supermoto-ish riding position on poor roads. Soon after I hopped onto the RC and it felt like a world of a difference. The crotch rocket riding position initially comes as a shock but it quickly dawns that this is quite a roomy bike. There's quite a reach from the saddle to the wide faux clip-ons and it almost feels long like a Karizma; until you turn around and notice that there's barely a foot of space behind you. You also notice the new grips that are probably better when riding without gloves but we like the Duke's pimpled grips in our gloved hands. I like the Duke because it allows me to sit upright but the RC underlines just how compact a riding position the naked bike has. In fact, the Duke seems to put your legs in an even racier position because the exaggerated grooves in the tank lock your knees into place while the RC allows you to move about. If you're very tall then you will definitely fit better on the RC. Also worth mentioning are the new footpegs and gear/brake levers that look much nicer and should prove more resistant to breaking. The mirrors with integrated turn indicators (great for the track where you can simply take them off together) are a little more effective despite not offering the same range of adjustability. So ironically, the RC's riding position wasn't as extreme as I thought it would be. But after an hour on the bike I needed a break. We pulled over and Halley excitedly said, "The Duke feels royal man, so comfortable!". Now you might think we stopped for me to rest my wrists. But it was my backside that was doing all the protesting. If you look at the Duke and RC seats, they both appear to be made from the same material and have the same firmness. The Duke's wide seat takes some getting used to but is actually very comfortable on long rides because you don't sink in. But the RC's seat is narrow and curved, and your sit bones will inevitably be perched on the curved surfaces with no respite for the middle of your bum which will quickly result in quite a lot of pain. Getting the top of the seat skimmed off for a flatter surface might help the issue. But it is quite a spoiler on an otherwise not uncomfortable riding position. In fact, as Shumi told us when he returned from Modena, there were more sore backsides than any other complaints at the RC world media launch. 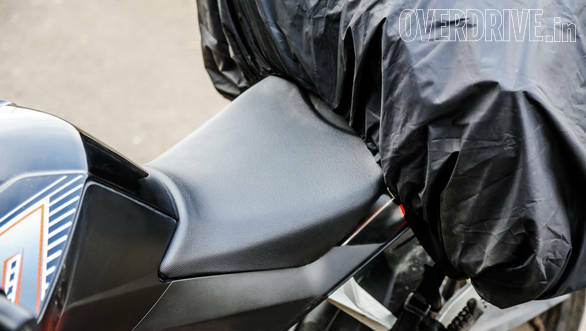 Conversely, the softer, forward sloped pillion seat on the RC is actually more comfortable than the short, hard and flat pad on the Duke that can be quite unnerving for passengers. At Karad, about 300km down the road, we fuelled up again and hit the road. Interestingly, despite running the same engine, the RC seems less frantic than the Duke with a slightly more linear power delivery and a calmer demeanor. She also sounds slightly different but that's probably down to the fairing playing with the acoustics. The fairing also helps the RC feel a little cooler in traffic, until you get stuck in a jam where it will get just as hot as the Duke. Wring the throttle and both are neck and neck until about 130kmph after which the RC leaves the Duke for dead despite its extra 12kg. That's because the Duke with her upright rider is starting to fight the air while the RC's aerodynamic fairing means less work at higher speeds. 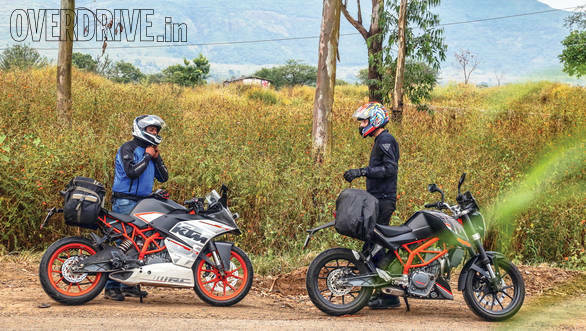 As a result the RC hits her top speed of 167kmph with relative ease while the Duke needs a long stretch before she maxes out just short of 160kmph. The point isn't that the RC is faster flat out. At all speeds above walking, the RC will put less wind on your chest and that'll make you less tired on long rides. Aerodynamics also plays an interesting role in fuel efficiency. In town, the lighter Duke sips a teeny bit less but on the highway, the RC's slippery shape makes up for its extra weight. Both bikes were returning a near identical 24kmpl at sustained triple digit speeds. Pleasantly, efficiency doesn't really drop even if you increase cruising speed from say, 115kmph to 125kmph. It's acceleration that consumes fuel - a steady hand allows pretty high velocities without having to watch the fuel gauge drop at an alarming pace. Both bikes were running into reserve like clockwork at around 200km - so despite having a smaller tank (10 litres vs 11 litres), the RC seems to have about the same useable range. If you're riding to Goa from Mumbai or Pune you simply have to use the Chorla route via Belgaum. It's paradise - one long ribbon of fresh and smooth tarmac that snakes its way through the forested Western Ghats. This is what these bikes were born for. The Duke is easily one of the best handling motorcycles you can buy today. But the RC takes it a step up. 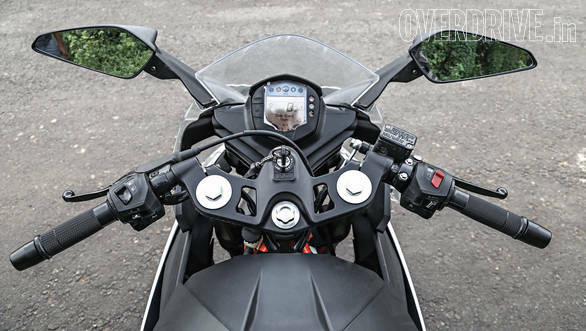 The front end gives you so much information and the bike feels very agile and super eager to drop into corners. Once in, the RC holds lines with a level of confidence that the Duke cannot quite match. This is probably a combined effect of the sharper steering, more weight on the front and handlebars placed closer to the centre of the bike as well as to the front axle. The RC gives you so much more information, which is great on a winding road. At seriously high speeds, especially when accelerating, the RC also is more rock solid and trustworthy than the Duke. The Duke's extra leverage at the bars and the less weight on the front can generate a slight weave that isn't a serious issue but quite a distraction. On a trafficked highway like the one we were on, the Duke was able to keep up, but show both bikes a racetrack and the RC will be gone in a matter of a few corners thanks to the confidence and involved feel it gives the rider. Hop on the Duke after the RC and it feels a bit loose. You sense that you're not quite plugged into the motorcycle and your inputs produce instant results but it gets hard to control the quality and quantity of the results until you recalibrate quite a bit. The RC feels alert, the Duke is almost hyperactive. 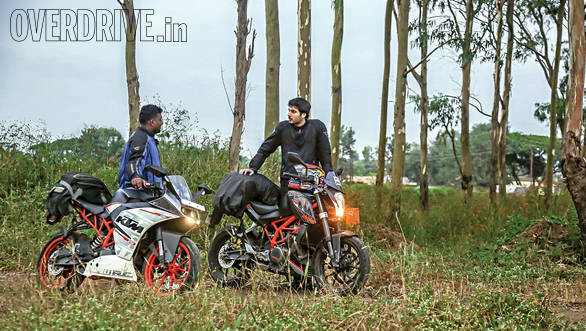 But this extremely reactive nature plus the upright and taller riding position makes the Duke a serious weapon in urban conditions and it will take a skilled and smart RC rider to keep up with a headbanging Duke in traffic. Perhaps the only thing I don't like on both motorcycles is the front brake feel - it feels a little wooden when you really get on it. 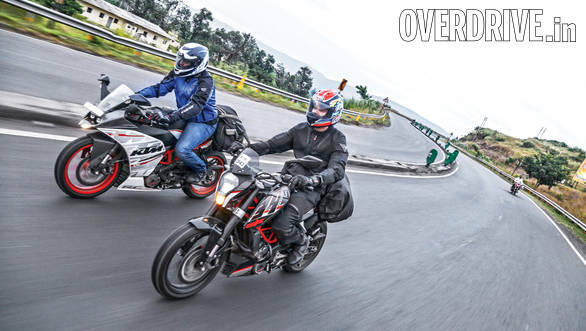 Braking performance is perfectly adequate with ABS keeping things under control but these bikes deserve a little more bite and feel. Alan who joined us on the way back from Pune to Mumbai said he found that the brakes on our long term FZ V2 that he was riding felt nicer. Despite stops for fuel and food we'd dispatched 500km at an average speed of 92kmph. And we could have gone on for 500 more (given a kinder seat on the RC). And that's the joy with these two bikes - they are fantastically capable highway machines. You will almost always be the quickest vehicle on the road and you will do so without undue effort which leaves you calm, focused and thereby safer. Quality is typical KTM on both bikes - stunning in most areas but iffy in a few. The RC appears a little more premium thanks to its new footpegs and the fact that it hides all the wiring that is a bit of a sore spot on the naked bike. But there's no doubt that the faired bike is going to be very difficult to keep clean with its many slashes and crevices in the body work. The black plastic panels between the frame spars and that transparent fairing plastic will be particularly hard to clean out. Oh and that lovely satin grey finish is going to scuff and wear quickly - it's already begun to on Halley's bike. 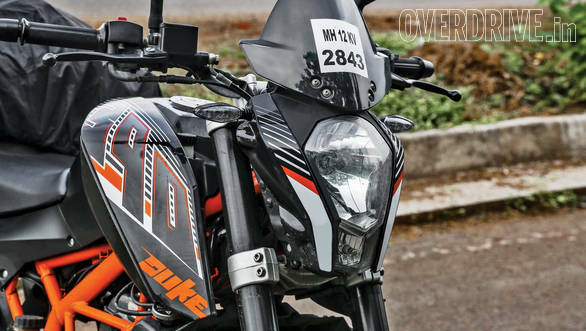 When the 390 Duke first came out, the forums went ablaze with how sporty and thereby, demanding and uncomfortable the bike was. But today the RC makes the Duke look practical and cossetting in comparison. By the tone of this story, the RC will clearly read as the better bike, and it is definitely so when it comes to performance. For your extra Rs 25,000 you get discernibly better handling, great looks and a fairing that produces stronger high speed performance. It's actually great value for your money. If you live near a racetrack or ride through twisties on a regular basis, the RC is undoubtedly the motorcycle for you. But the same rewarding razor sharp focus can get demanding and tiring once you've had your fun on the bends and have returned to everyday riding. I guess, in a way, focus offers greater rewards. But the conditions in which those rewards can be had become more narrow and therefore harder to achieve regularly. What I'm saying is that the RC 390 is a special little motorcycle that works wonderfully as a sportsbike. By that very nature, it's also harder to live with everyday. The Duke, on the other hand, is an everyday motorcycle which is sporty enough to keep you enthralled. And that's the critical difference between the two. At a racetrack or on a mountain road, you will miss the calmness and accuracy of the RC. And how connected you feel to the road on an RC is something the Duke cannot offer. But in practically every condition, whether it is the urban crawl or the highway, the Duke has a stunning turn of speed with just enough practicality for me to know that Halley can keep his RC, I'm convinced I've bought the right machine. My Duke has only two real issues. The riding position is pretty cramped and at high speeds, I know that the RC 390 will be a little faster. But I've learnt to live with the first one and the second one, well, Halley'll arrive first but I'll arrive right after him feeling vastly fresher. Win.